Welcome back to Day THREE of October Krafty Peeks at Kraftin' Kimmie Stamps! Today we have a super cute new set by artist Melissa Baker-Nguyen and it's SO unique! 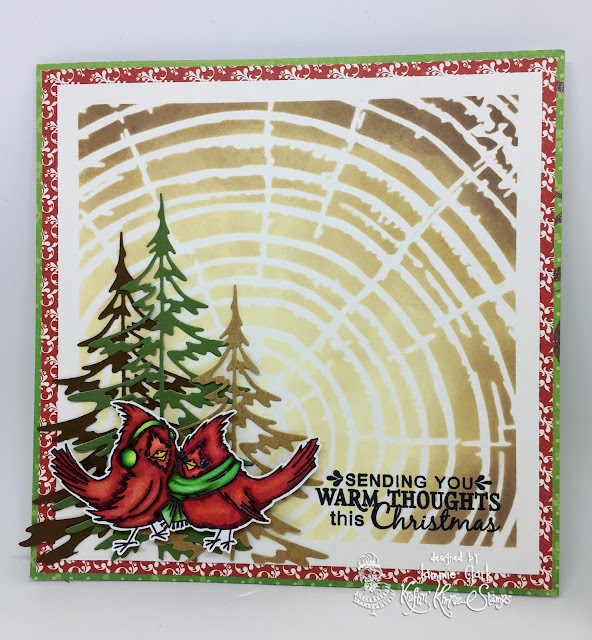 Check out our holiday feathered friends!! It's MERRY & BRIGHT BIRDIES!!! 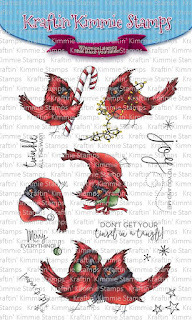 This fabulous set comes with FIVE main images of these fluffy peeps, plus super fun sentiments and accessory stamps!! Check out these little guys in action as you hop around the Krafty blogs today! You'll see the list of Krafty design team members and Krafty Guests below and be sure to leave some love at each stop because one lucky commenter is going to WIN a gift voucher to the krafty shop EACH DAY of the peeks! I used a stencil from Gina Marie dies and some Oxide inks to make the background. Then I used a Tim Holtz die to cut out the trees and layered them up on some echo park papers and I think it came out SUPER cute! Just love these little birdies! ALL FOUR of the new October clear stamp sets will be released on Saturday afternoon! Be sure to join us at the LIVE Online Release Party beginning at 2pm EST! Come join us to help celebrate the new release, check out lots of krafty kreations, have a chance to win some prizes and hang out with all our krafty friends! Hope to see you there! Tootles! Your coloring is very nice. Your background is super cool. Love your card! The background looks like gold. Love how you put it all together. Love what you did with this! Beautiful! The background is amazing!! Great job!! Your idea to offset the cardinals with such a unique background is eye catching. Eye-catching and pretty like a sunrise. Wow ! That's a gorgeous card and background ! Fabulous card! The background is awesome. This is fabulous! Love the background and those trees!